WELDING AND CUTTING – 2019 is an annual international specialized exhibition on welding equipment, materials and technological processes for welding production. 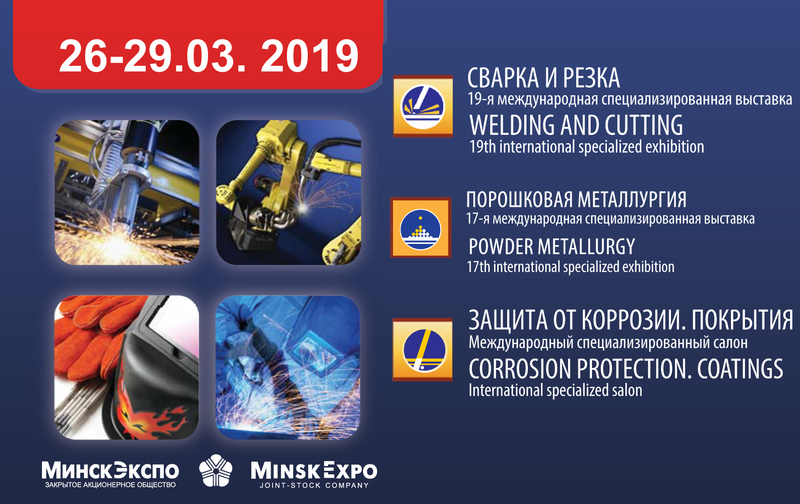 WELDING AND CUTTING – 2019 will be held from 26 to 29 March 2019 at the address: Pobediteley Ave, 20/2, Minsk, Republic of Belarus. The exhibition covers a wide range of industrial technologies in the field of welding ranging from manual arc welding to rail welding equipment and track machinery. Every visitor will find what he exactly needs! More than 200 companies from 17 countries (Belarus, Georgia, Russia, Austria, Great Britain, Israel, Italy, China, Germany, Latvia, Lithuania, Estonia, Poland, Turkey, Ukraine, the Czech Republic and Switzerland) will take part in the forum. The exhibition will be carried out together with the international exhibitions ”Powder Metallurgy”, ”Metallworking” and the international specialized show ”Corrosion Protection. Coatings.”. We invite you to visit our stand number D27.